While there is a compelling and interesting story to be told in Judith: Memories of a Lady Pig Farmer, the Blyth Festival may not have found it just yet. Judith: Memories of a Lady Pig Farmer opened on the Memorial Hall stage on Friday night. It is playwright Heather Davies’ ambitious adaptation of the novel Judith, written by Aritha van Herk. Not only had it been announced earlier that day that van Herk would become a Member of the Order of Canada, but she was also in the Festival audience that night. The play brings together a cast largely comprised of newcomers to the Festival stage like Georgina Beaty, Graham Cuthbertson, Nathan Howe and Daniel Roberts, complemented by familiar faces Marion Day and Tony Munch. Perhaps it’s the reality of being adapted from a novel and wanting to remain true to the source material, but the foundation for the show is set early with an abundance of exposition. Whether it’s Judith, played by Beaty, giving us information we need through monologue or actual narration by way of passages read by other cast members as Judith works away in her barn, the show starts off on a foot that violates one of the cardinal rules of visual entertainment: show, don’t tell. In the first few minutes of the play, as Judith feeds her newly-acquired pigs, she is visited by three figures from her memory, not unlike Ebenezer Scrooge’s three ghostly visitors in A Christmas Carol. Apparitional visits from Judith’s father, her former boss and boyfriend and an estate lawyer (Judith’s parents die early in the play, this is not a spoiler) all help to quickly establish a foundation so the story can be told. None of this foundation building, however, is done through dialogue, it’s either done through monologue or apparition-like flashbacks. This is unfortunate, because the play is at its best when its actors are interacting with one another. After first turning her back on the family farm and the world of pig farming, much to her parents’ disappointment, Judith makes her way to the big city. Once there, however, she finds it isn’t all it’s cracked up to be. A relationship with her boss, played by Graham Cuthbertson, that ultimately proves to be both unhealthy and abusive paves the way for Judith’s return to life on the farm. This is helped along in no small part by the death of her parents, who perish in a car accident. Despite familial disputes, they choose to leave their estate to Judith. It is with this windfall that she decides to buy 10 sows and start her own pig farm. Judith takes some time to find her footing in her new profession, but finds it in the community by way of neighbour Ed Stamby, played by Munch, his wife Mina, played by Day, and their three sons, including Jim, played by Howe, who takes a particular shine to Judith, or Judy, as he’s taken to calling her, much to her chagrin. It is around the Stambys’ dinner table that the play shines brightest. The interactions between Judith and her neighbours are often funny and at times poignant. Unfortunately, due to Judith’s level of comfort in her barn alone, they are few and far between as she often dashes home to be by herself. Another strong point of the play is the music, which demonstrates restraint and discipline. It is used sparingly and effectively, adding quick shots of narration or mood-setting soundtracks to scenes throughout the play. As the play continues, however, its pacing can be a bit of a head-scratcher. At times, the story grinds to a screeching halt, while at others there is just far too much going on at once. Flashbacks interrupt crucial present-day scenes, which makes it difficult to become emotionally invested in either, while at other times, Judith feeding her barn full of pigs can feel time-consuming and repetitive. The cast, full of young newcomers, is excellent and does the best with what they have. Beaty is an engaging presence on stage and bonafide lead actor, while the rest of the cast members nail their cues. They’re heartbreaking when asked to be and funny when they need to be – and crass when asked to be (a confrontation at a local bar is one of the best scenes in the play). One can’t help but see their potential ahead of their collective creation, Wing Night at the Boot, which will be on stage later this season. There is a powerful and relevant story to be told with Judith: Memories of a Lady Pig Farmer. The team behind the production addresses the uphill battle of a young, enterprising woman taking on what many perceive to be a man’s job in a number of ways. Whether it’s constantly being asked whether she’s married or fending off unwanted advances or sexist remarks, Judith’s struggles are those to which many women, in this area and beyond, can relate. It’s just unfortunate that the choppy, clunky nature of the storytelling forces the audience to disengage right when they begin to care. 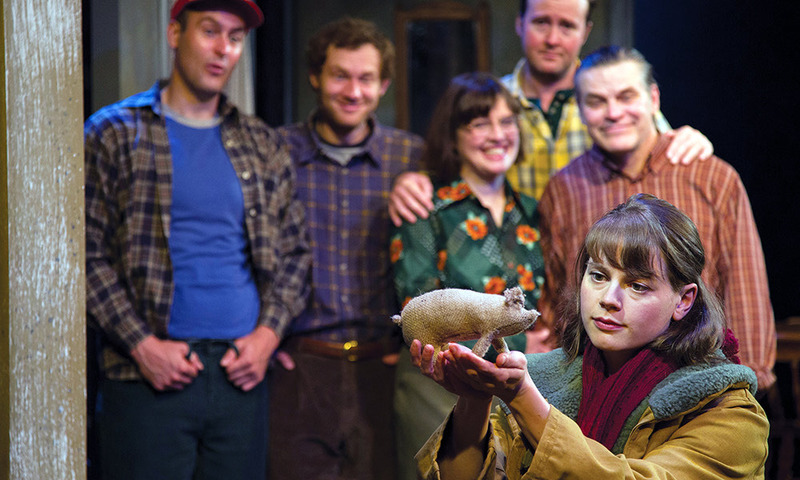 Judith: Memories of a Lady Pig Farmer plays in repertory until Aug. 11.